On arrival at Paro International Airport, you will be received by representatives of Rainbow Tours and transferred to a local restaurant for lunch. After lunch drive 2 hours to Thimphu, the capital town of Bhutan. Afternoon visit the town and do some sightseeing. After breakfast, begin a three hour journey to Punakha Valley. 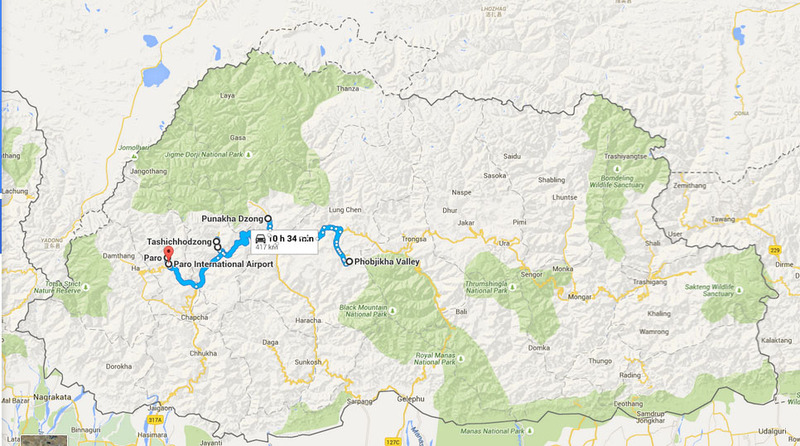 On the way, drive over the spectacular Dochu La to the verdant Punakha Valley. The road winds through lush pine forests to the 10,000 foot pass, which, in good weather provides a 180-degree panorama of distant Himalayan summits. You can also walk around the 108 recently built stupas. As you descend from the pass, observe dramatic changes in vegetation. At the lower elevations, cacti, banana plants, poinsettias, and other semi-tropical plants dominate the exotic landscape. In Punkha stop at Lobesa for lunch and continue drive to Punakha Dzong to see the FESTIVAL which is held in the courtyard of the dzong. Punakha Dzong (fortress-monastery), is situated at the confluence of the Pho and the Mo Rivers. This huge fortress was built in 1647 by Shabdrung Ngawang Namgyal, the unifier of Bhutan, and served as the national capital until 1966. The dzong has been undergoing a major restoration for the last five years, and entire portions have been rebuilt using centuries-old techniques providing an unequaled opportunity to observe the fine, traditional craftsmanship Bhutan is known for. The Tsechu is a festival in honour of Padmasambhava “One who was born from a lotus flower,” popularly known under the name of “Guru Rimpoche,” the Precious Teacher. This Indian saint contributed enormously to the diffusion of Tantric Buddhism in the Himalayan regions of Tibet, Nepal, Bhutan etc. around 800 AD. He is the founder of Nyingmapa, the “old school” of Lamaism, which still has numerous followers. The biography of Guru Rimpoche is highlighted by 12 episodes on the model of the Buddha Shakyamuni’s life. “The Tsechu” which has become the name of a popular festival commemorates each episode around the year on the 10th day of the month. The dates and the duration of the festival vary from one district to another but they always take place on or around the 10th day of the month according to the Bhutanese calendar. During Tsechus, the dances are performed by monks as well as by laymen. The Tsechu is a religious festival and attending it, it is believed one gains merits. It is also a yearly social gathering where the people come together to rejoice dressed in all their finery. Afternoon drive three hours to Gangtey in Phobjikha, a glacial valley on the western slopes of Black Mountain national park. The valley is a designated conservation area and borders the Black Mountain National Park. Because of the large flock of black-necked cranes that winter here (from late October to late March), it is one of the most important wildlife preserves in the country. In addition to cranes there are also barking deer, wild boar, sambar, Himalayan black bears, and leopards. Phobjikha Valley is circled by beautiful pine covered mountains. At the valley’s center, rising dramatically from a small ridge, stands Gantey Gompa, one of the oldest Nyingma Bhuddist monasteries in Bhutan. Gantey Tulku Rimpoche, the head lama of Gangtey Gompa, is the ninth incarnation of Terton Pemalingpa, the famous 14th-century Treasure Revealer from Bumthang, one of Bhutan’s famous Buddhist saints and an ancestor of the ruling Wangchuck dynasty. Gangtey monastery overlooks the large green expanse of Phobjikha Valley. The extensive complex consists of the gomba itself, the monks’ quarters, meditation centers, and schools. In the evening you will have opportunity to see roosting of Black necked cranes and to visit a farm house for local hospitality. Takin is the national animal of Bhutan and it's a herbiborous creature which stays in herds in their wild state. The have an affinity for mountain crags. In the folklore it's believed that this animal was created by Drukapa Kinley, the Divine Madman, from the body parts of buffalo and goat. Visit the National Museum (Ta-Dzong) once the watchtower for the Rinpung Dzong. It was converted into the National Museum in 1968. The museum stands on a promontory overlooking the Paro valley. Visit the Paro Rinpung Dzong. A flagstone path rises gradually from a beautiful wooden bridge with shingle roofing and abutted by two guardhouses, to the dzong. Today the Dzong is the seat of the district administration as well as the home for the monastic school. The central tower (Utse) of the Dzong, with its superb woodwork. Afternoon free. Evening visit quaint Paro town and enjoy dinner at a cozy local restaurant, followed by a stroll through town. Meet local shop owners and view Bhutanese handicrafts.